Enough dreaming. It’s time to ride! Imagine the thrill of touring Melbourne on a thumping Harley Davidson Motorcycle, a bike that can't fail to stir the emotions and the soul. When and where can I ride? 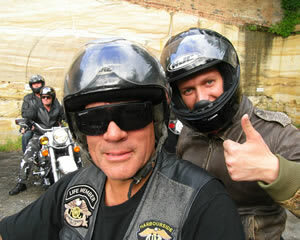 Harley rides are available 7 days a week from 7.30am till midnight. Pick ups are available from Frankston Station. A sidecar is available which can carry up to 2 people, at an additional cost. Loved my ride with Andy, it was a great experiance and will recommend to others. Thanks Andy for a wonderful time. The 2 Hour Harley Ride was a great way to unwind especially since I used to ride a bike years ago. I thoroughly enjoyed the Harley experience-fantastic! Thanks Adrenalin for a great experience. Love to try another great Adrenalin adventure.